Going to Bangkok is not complete without experiencing its numerous night markets. You can either go shopping or eat. In my case, I've been to two different night markets in a span of two days. 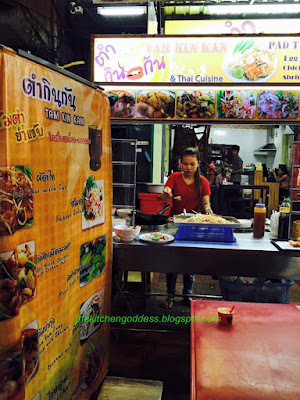 The first one was at Pat Pong- read more about our first taste of Pad Thai at Tip Top Asian Dining & Grill in Pat Pong Night Market. 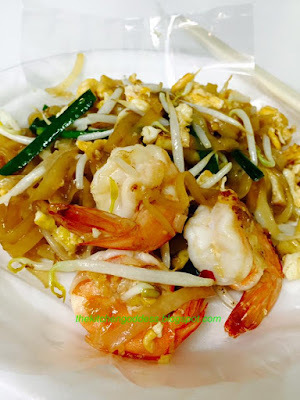 As compared to the pad thai we had the night before, an order at Tam Kin Kan only costs 50 baht for plain serving of pad thai. 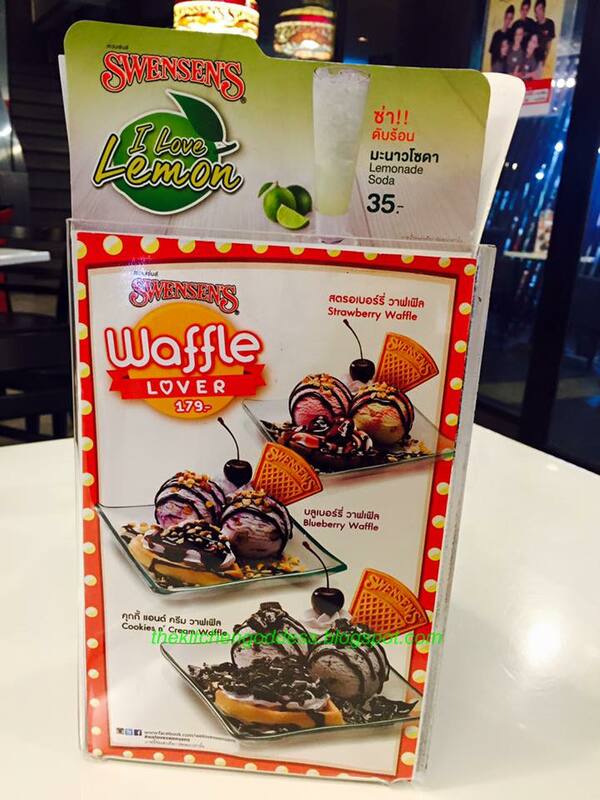 I got the one with shrimps and it costed me 65 baht. Still pretty cheap! What's nice here is that you can watch your food being cooked. Most of the sellers are not really good in English so you may have to use a lot of hand gestures. Maybe its the ambiance or maybe its the price but I like the pad hai her at Tam Kin Kan than the one I had at Tip Top Restaurant. The noodle has a chewier texture and I can taste a generous amount of lime. I'd love to comment that prawn are fresh also, succulent too. I skipped the Thai iced tea and bought a bottle of water for 10 baht. Its already 10pm when we had our dinner but the air is still warm. I would've wanted to experience dining al fresco like the group on the photo but decided to eat at Tam Kin Kan's restaurant. Actually, the restaurant is more like a small canteen but has a "cleaner" appeal than eating along the street. 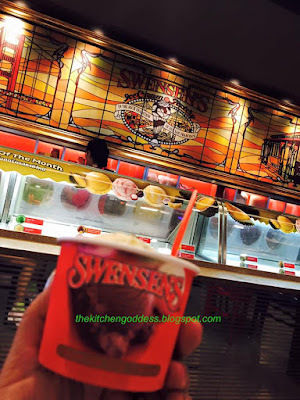 Here's a happy find at Khao San Night Market- Swensen's! I love the ice cream at Swensen's and I know I'll regret it if I won't order a scoop. I had a cup of my favorite rum raisin- yummy! There are still a lot of delicious-looking food being sold along the street but since we're going to the floating market the following morning, we decided to call it a day. I would love to visit Thailand with my boys one day. 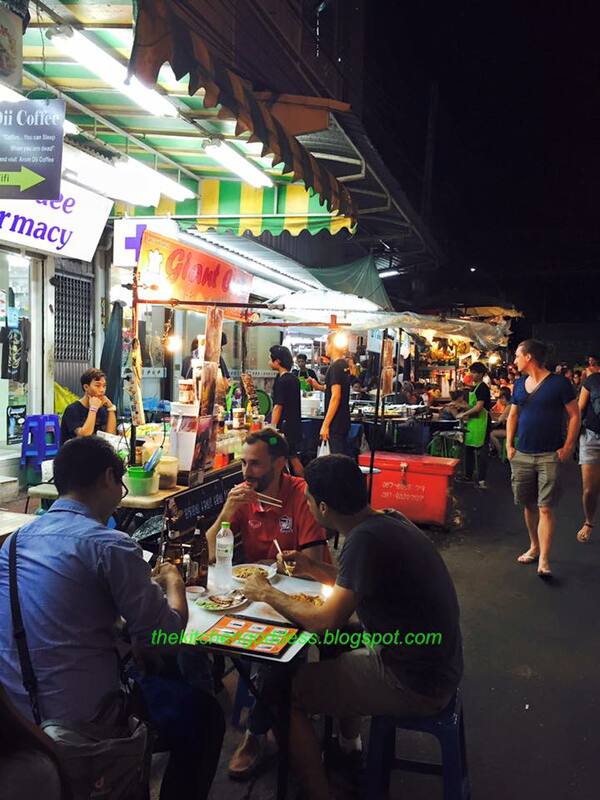 You can never really feel the local vibe, unless you try out the local street food fare, right? That pad thai did look delish!